Crewel embroidery, or crewel work, usually denotes a specific type of embroidery: flower and animal motifs worked in wool, with a variety of colors, shades, and textures, using a variety of associated stitches. Embroidery that mimics crewel work but is worked in threads other than wool fits in the category of surface embroidery, but it’s crewel wool that makes crewel work what it is. If you’re unfamiliar with crewel work, there’s an excellent little book on the market that will introduce you to this beautiful art. It’s the Beginner’s Guide to Crewel Embroidery by Jane Rainbow, and it’s published by Search Press as part of their Beginner’s Guide needlework series. If the cover alone doesn’t captivate you – the shading, the textures, the beautiful colors – the inside will. Even if wool is not your primary choice when it comes to threads, you will learn much that is useful and beautiful for any surface embroidery technique from this book. The author gives detailed instructions on common stitches and techniques used in crewel work: stem stitch, chain stitch, split stitch, satin stitch, fly stitch, buttonhole stitch, detached buttonhole, spider’s web stitch, French knots, laid filling, soft shading, and bullion knots. She doesn’t just give them to you as a dictionary, though. Along with giving you step-by-steps on each technique, she gives you a project that incorporates the technique. 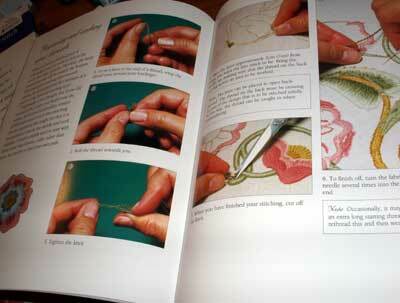 The book begins with the basics of embroidery – materials and tools, starting and ending threads, and so forth. Then it moves into the various stitches addressed. The stitching section is divided by project, and the projects incorporate the best of crewel embroidery traditions. They are beautiful! Scattered throughout the book are embroidered examples of different motifs worked in crewel. 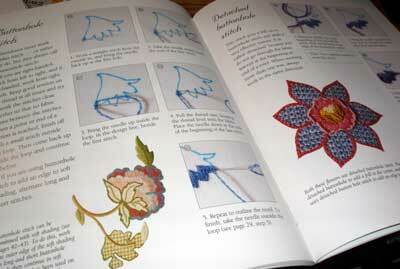 At the end of the book, you’ll find an excellent detailed instruction on blocking embroidery work. While you may often see “finish work” in a book, I think this is one of the best overviews of finishing that I’ve seen in this kind of book. You’ll also find a gallery and some patterns. 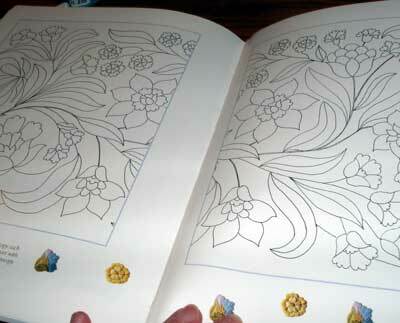 The book has patterns throughout, but at the end, you’ll find three fairly large patterns that incorporate the techniques covered in the book. The “Beginner’s Guide To” series by Search Press is really excellent. I’m excited to see it expanding regularly. They haven’t yet produced a general “Beginner’s Guide to Hand (or Surface) Embroidery,” but I hope they do some day! And, on a final note, even if you aren’t interested in crewel work and wool, the patterns and stitches can be worked in other mediums. But don’t tell any crewel aficionado that I said so! 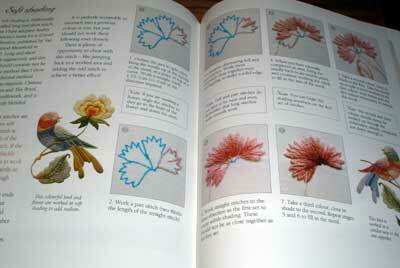 In the US, you’ll find Beginner’s Guide to Crewel Embroidery through Amazon. 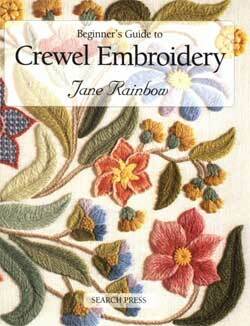 Worldwide with free shipping, you can pick up Beginner’s Guide to Crewel Embroidery through the Book Depository. What a coincidence! I have been looking at this book and have considered getting it. I recently purchased the Beginner’s Guide to Silk Shading recently and am quite pleased with it as well. Why was Berlin work omitted? Hi, Naner! It’s a good book. If you like surface embroidery, I don’t think you’ll be disappointed! Eu gosto muito de Crewel, mas tenho pouca literatura sobre esse bordado. Agradeço a oportunidade de Partiicipar. ME GUSTARIA SABER COMO COMPRAR LOS LICBROS PARA BORDAR SOY DE MEXICO D.F. I have purchased this book but I am getting frustrated because I cannot find any of Jane Rainbow’s kits online anywhere. I particularly like the Avalon&Paradise designs. I was wondering if you know where I can purchase these kits? Previous Previous post: Needlework Book Dilemma! Calling on Readers for Help!